Dozens of downtown workers lined up at foodtrucks, Thursday. 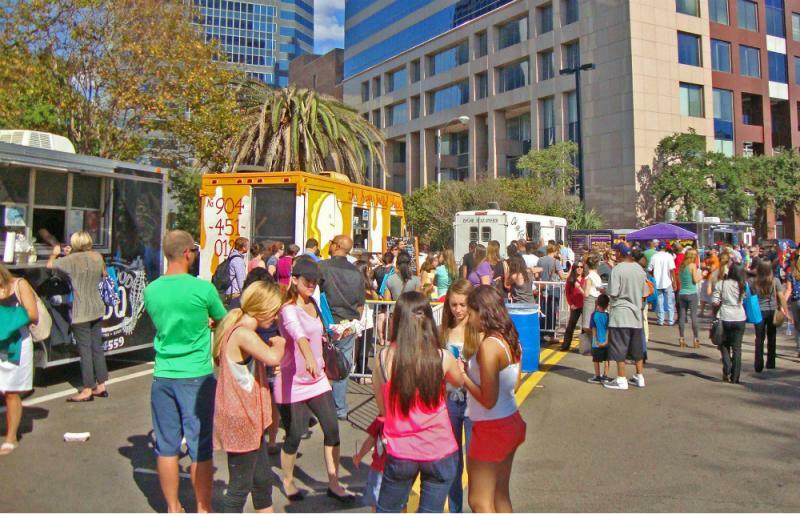 And that dispute resurfaced several months ago after a food truck court opened up adjacent to downtown Jacksonville’s SunTrust Building. Each weekday people flock to the court for lunch which consists of about five food trucks parked side by side. Some restaurants say the trucks are taking substantial business from them, yet not investing in downtown property as they have. The restaurant owners have banded together. Jacksonville City Councilman Scott Wilson said after several meetings between the two groups a compromise wasn’t reached. So he told the interested parties to give him a call if anyone had a reasonable solution. Wednesday evening, one restaurant owner called a meeting with Wilson and proposed a compromise. “We had a list of 25 items we wanted (action on) and through the procrastination and political wrangling, they’ve beat us down to one and basically we’re just asking for a little help now,” said Tom Thornton, owner of The Bank BBQ and Bakery on Forsyth Street. Thornton, who has been leading the brick and mortar side, asked for legislation that would limit food trucks to only one-per-block, which the city refers to as a block face. That way they couldn’t congregate in a food court. He’s also asked that the current 50-foot distance requirement between food trucks and restaurants be increased to 150 feet, and be applied to food trucks’ distance from each other. Thornton said breaking up the food court wouldn’t solve the problem, but it could help. He said downtown restaurants are closing down because of the food trucks, but Wilson said new restaurants are also opening up and seem to be doing well. Other restaurant and food truck owners filled the room along with Wilson and council members Reggie Brown and Bill Gulliford. Gulliford said he doesn’t think passing that legislation would enable the city to dismantle the food truck court, which is operating with a business license on private property. City lawyers didn’t have an immediate answer, so Gulliford asked them to do some research to have the answer at a future meeting. However, Gulliford doesn’t think it’s fair restaurants have to provide bathrooms, but food trucks providing seating, don’t. He said there should be a level playing field. 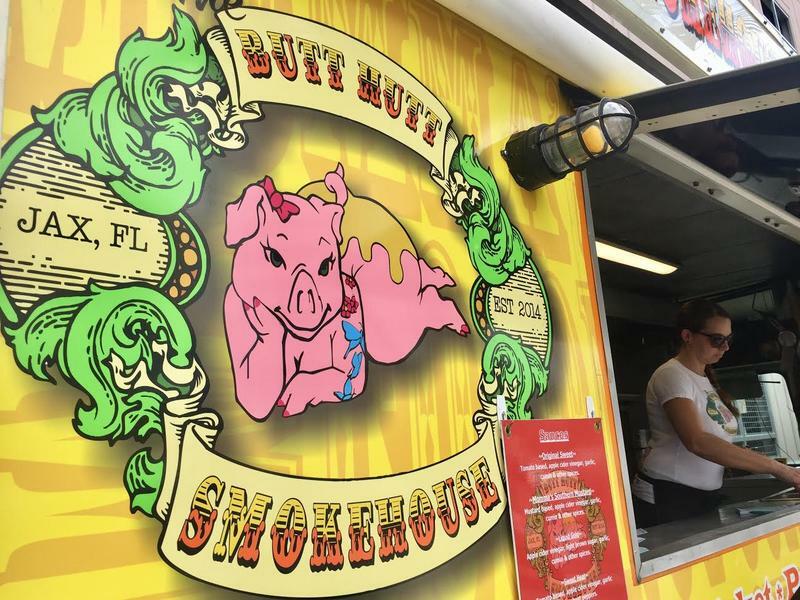 “I think that food trucks should not be allowed to put tables and chairs out if they don’t provide facilities, that’s something we probably need to formalize,” Gulliford said. Although it isn’t certain if city legislation could shut down the food court, Brown said it could be worth proposing legislation for the future. “We need to learn to never do this again,” he said. 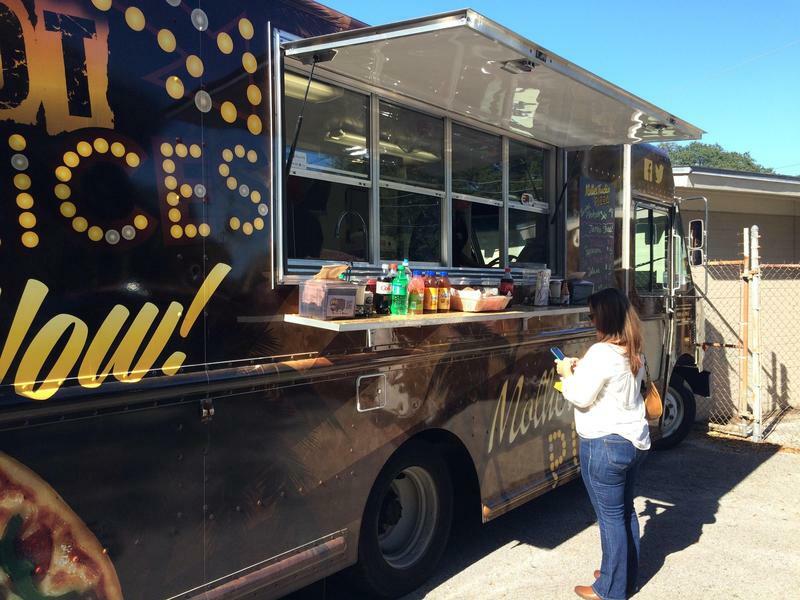 Brown was the sponsor of a 2014 bill regulating food trucks. Downtown Investment Authority CEO Aundra Wallace also spoke at the meeting, saying he’s met with the restaurant owners and told them the one-truck per block face might be the best compromise, but he doesn’t encourage council to increase the distance requirement between trucks and restaurant storefronts. He said that rule would leave almost no spots for food trucks. Wallace said the next meeting he’d provide maps of where food trucks could locate with different distance requirements. Although not discussed during the meeting, Gulliford said after the meeting he’d like to look at requiring trucks pay some kind of fee to operate downtown, since brick and mortars are paying property taxes. “I want to see lots of business but we want to be fair to everybody as much as we can,” he said. However food truck court co-founder Jack Shad said he doesn’t think piling on more restrictions is the way to improve downtown. He said folks working downtown enjoy being able to get outside and choose from a variety of trucks. And other food truck owners said during the meeting, trucks aren’t the problem and if customers choose trucks over brick and mortar, trucks shouldn’t be punished for that. The group of restaurant and food truck owners along with the three city council members plan to meet again in a couple weeks with answers to some of the questions presented at the meeting. Gulliford said he’s not sure if he’d propose legislation since he represents the beaches, not downtown. 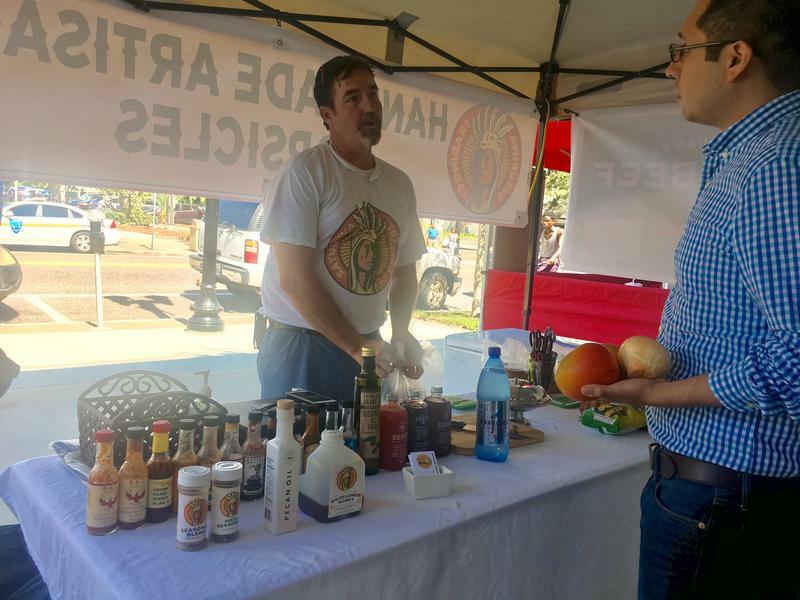 Jacksonville residents now have a mobile grocery store downtown. The Saturiwa Trading Company grocery truck is a new addition at The Court Urban Food Park on Hogan Street, where food trucks line up on weekdays midday. Every weekday, a rotation of four trucks will set up at lunch time for The Court: An Urban Food Park. 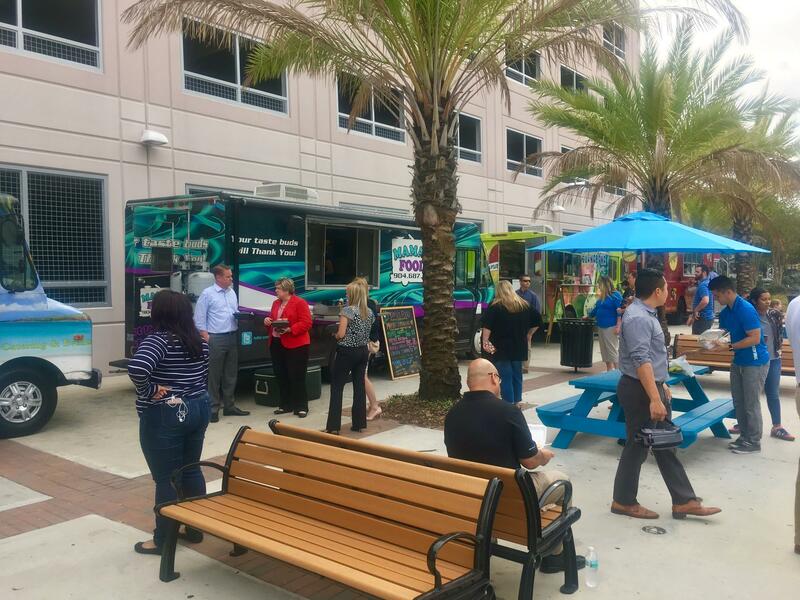 An ordinance to regulate where food trucks can operate in Jacksonville was withdrawn from consideration at Tuesday night’s City Council meeting. Councilman Reggie Brown’s proposal would require food trucks to set up at least 50 feet away from brick and mortar restaurants unless they’re given written consent by the owner to be there. Food trucks downtown already adhere to similar rules.